Boduch's Blog: How Gaphor Checks Association Ends. How Gaphor Checks Association Ends. With the Unified Modeling Language, comes a well defined meta model. It is this meta model that defines the semantics of the modeling elements available within the UML. An important feature of this meta model is consistency enforcement. The semantic rules defined in the UML meta model not only supply the UML modeling element but also govern how those elements may be used in relation to one another. If these rules, specified by the meta model could be verified for any given UML model, it could provide a means of ensuring a consistent model. As an example UML element that has the potential to be validated for consistency, consider the two ends of an association. One end could be a subset of the opposite end. There are a couple ways that this arrangement could go wrong. There could be missing names or there could multiplicity inconsistencies. 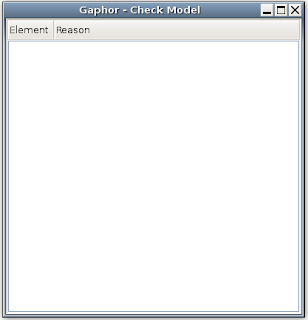 The Gaphor UML modeling tool provides a checkmetamodel plugin that is capable of validating the association ends, as well as other potential meta model issues. This plugin can be viewed by selecting "Tools", "Check UML model". Illustrated below is the dialog that will be displayed. Only errors will be displayed here so if there is no content, the current Gaphor UML model is consistent with the Gaphor UML meta model. When the checkmetamodel plugin validates the UML model, there are three functions involved. These functions are check_associations(), check_association_ends(), and check_association_end_subsets(). The check_association_end_subsets() function is important when validating association ends. It is the only validation that actually takes place on associations. The check_associations() and check_association_ends() functions exist for infrastructure purposes. If new functionality were to be added to Gaphor association or Gaphor association end checking, it would be placed in one of these functions. As the same suggests, the check_association_end_subsets() function will make sure that any association ends that are subsets of the opposite association end are consistent with one another. There are two basic tests to make this happen. First, the plugin will make sure that a given association end that is a subset of the opposite association end, contains names that actually exist in the opposite set. There can't be a subset property which contains elements that do not exist in the referenced set. Next, all multiplicity upper bounds in the subset need to be consistent with the upper bounds of the opposite set. This will ensure a multiplicity consistency amongst association end subsets. With Gaphor, these meta model consistency checks are especially important because the meta model is loaded into Gaphor as any other UML model would be. If the core Gaphor UML meta model fails, there isn't much hope for any models created by users. The checkmetamodel plugin also offers potential for adding additional checking functionality. Thanks for the outline of the checkmetamodel plugin. This plugin has been written as aid when extending the meta model (e.g. when implementing new functionality). It has been written with the functionality of the code generator (the one that creates gaphor/UML/uml2.py out of gaphor/UML/uml2.gaphor) in mind. The code generator does quite some stuff to figure out what to write based on the model. It relies on the descriptors (properties) defined in gaphor/UML/properties.py, since those are the classes that provide the behaviour for the meta model (such as sending events on changes). There is also a uml2.override file, which is used to fill in the gaps (like derived attributes).